A day after the terror attack in Jammu and Kashmir that claimed the lives of 40 CRPF personnel, the VHP Friday said terrorist bases in Pakistan must be destroyed and expressed hope that the Indian government would respond to it "resolutely, firmly and effectively". In a statement, VHP's international working president Alok Kumar said the act was perpetuated by a local youth, indoctrinated in the name of religion. "Clearly the young persons are being enrolled...to wage jihad, perpetrate murders, all in the name of religion and luxuries in 'jannat' (heaven). This is a challenge to all humanity and the global community must rise to answer such ideology," Kumar said. Demanding action against Jaish-e-Mohammad, a terrorist organisation which has claimed the responsibility for the attack, Kumar said it is a Pakistan-based and Pakistan-backed outfit. "Efforts to declare it a terrorist organisation have been vetoed at UN by China. The nexus must be broken and terrorist bases in Pakistan destroyed." "We believe that Indian government will respond to the attack resolutely, firmly and effectively," Kumar said. 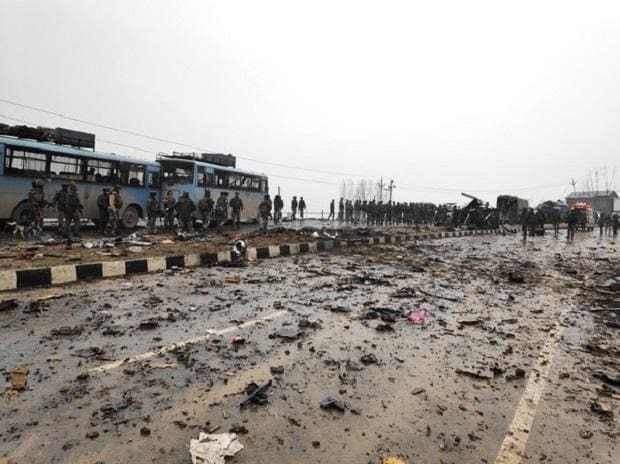 In one of the deadliest terror attacks in Jammu and Kashmir's three decades of militancy, a Jaish suicide bomber rammed an explosives-laden vehicle into a CRPF bus in Pulwama district, killing at least 40 personnel and leaving many critically wounded. More than 2,500 Central Reserve Police Force personnel, many of them returning from leave to rejoin duty in Kashmir Valley, were travelling in the convoy of 78 vehicles when they were ambushed on the Srinagar-Jammu highway at Latoomode in Awantipora in south Kashmir around 3.15 pm on Thursday.